As we approach one of the fastest cooling months of the season, will nature agree??? This month provides us with one of the more fascinating periods of weather as a brand new weather pattern emerges as the sun sets over the Pole in early October. Based on what I'm seeing, there is a likely atmospheric La-Nina response and many storms/troughs are likely to target the West/PAC NW as we open up October. Depending on how strong the eastern CONUS ridge sets up, parts of the Midwest/Lakes/OV will experience above normal temps to open up the month. I'm not to confident folks in the Plains will be as warm as those farther east. It'll all depend on how these systems track into the west coast. You could argue the torch across the West was a bit to much, but overall, the CFSv2 did do a good job with wild temp swings averaging out to a warmer west and cooler east. Big changes evolving in both the GFS/EURO around Day 7/8 which are the opening days of October. Both models have flipped to a bigger SW/W coast ridge and in response carving out a bigger trough over the central CONUS which was not there over the last 2 days of runs. What I think may be happening are the models responding to the warmer waters hugging the NW NAMER coastline. Notice the 4 consecutive frames on the 12z Euro run and how a trough gets almost absorbed into the pocket of colder waters north of Hawaii which are located right where the trough goes. I find this interesting because this is what we saw the models do back in the winters of 2013-14 & 2014-15. Some known bias's are to place troughs where there should be ridges due to SST temps. I'd like to see if this is a trend or just a "head fake" but my hunch is the trend will continue. It would also fit the 500mb pattern the CFSv2 is trending towards for the month of October. 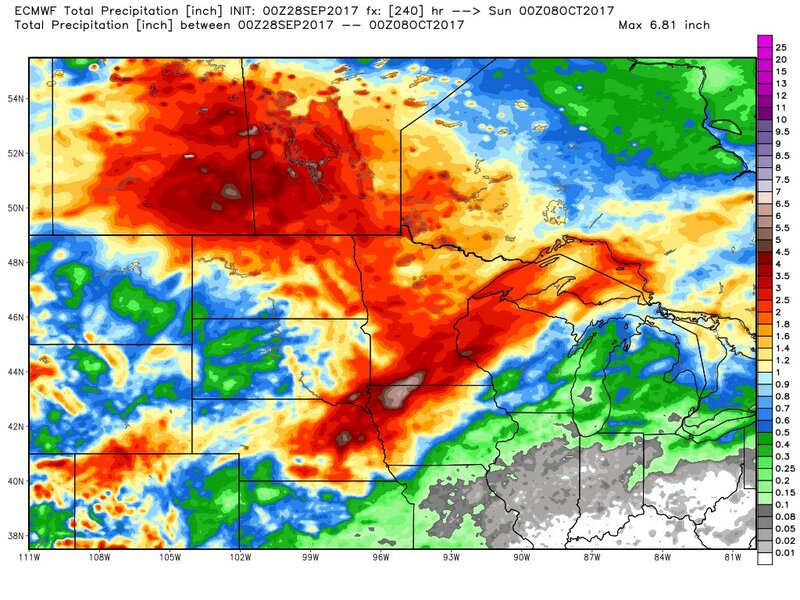 As we open up the month of October, GEFS are signaling a wetter pattern across the Plains states. For days, it has been showing a bone dry pattern. Let's see if it holds as the new LRC develops. Full on blow torch if that pans out. Remember that trough I have been anticipating targeting British Columbia/PAC NW??? It's showing up as we open October and trends in the GEFS are showing it dig farther south into the Rockies. Here is the 500mb trend forecast...notice the blocking across NW NAMER which was not there all but a couple days ago. I really think the models are underplaying the above normal waters hugging NW NAMER. Good trends. 00z Euro EPS..can you find the mean trough??? If this transpires, it would mean troughs have that look of digging farther south unlike October 2016. Plains states will likely be closer to the active storm track and result in above normal precip and closer to normal temps. For those in the Plains states, who remembers last year's long term long wave ridge that dominated the pattern??? A new year brings a new pattern and this one looks much more favorable for a SW Flow to open up October. Remember last year the early record cold which targeted British Columbia/Alberta region??? Troughs favored targeting SW Canada and the coastline of the state of Washington/Oregon. Storms did not really dig farther south into California early on in the season. This year, something different seems to be aligning which is better news for storms to track farther south and into the central Rockies instead of the northern Rockies early on in October. Here is a 500mb forecast for the first day of October and notice the ridge placement is farther east compared to last year which was in the middle of the nation. We'll have to see where storms intensify and track as the new pattern evolves but I'm seeing encouraging signs that this new pattern will deliver more action this season across the states that were hung dry last Autumn. Looks like we're locked in for a warm first half of October, which means we will likely not see a freeze until the second half of October, which is rare. That doesn't dictate how Winter will go, obviously. One of our best Winters in history had our first freeze fall in November. As we get past the second full week of October, it looks like we get into a more dynamic pattern, which is then I think the lower elevations of the high Plains and maybe CO will see their first snow chances, as long as our possible first freeze here. It is looking like both the EPS weeklies and most CFSv2 members are picking up on a nice trough out of AK mid-October. Agree, 1st half looks toasty and wetter for those who missed out on the rains. I don't mind the warmer temps so long its active. 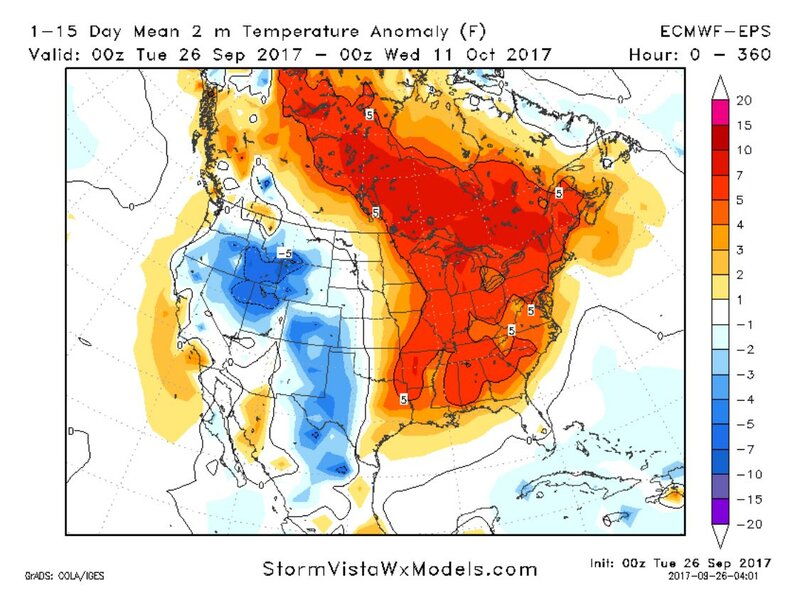 As you stated, warmer October's don't necessarily dictate what happens in Winter, esp with a mid Niña incoming. I've been noticing that trough around middle of the Month showing up on the CFSv2 weeklies. Start warm and finish cold? I hate to say this, but some places on here east of the Plains will be seeing more record heat Week 2. Guidance is suggest a powerhouse ridge in the East to blossom. However, there is some caution as to how much influence blocking across NW NAMER/NE PAC will have across the Plains/Midwest. I'm seeing more blocking on the EPS/GEPS that was not there over the last 3 days of runs. 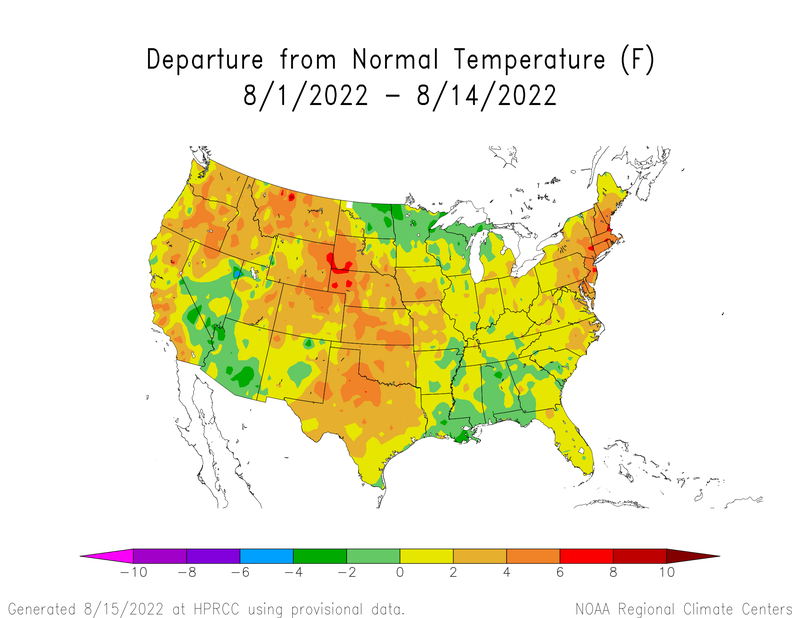 Nonetheless, it looks like a warmer regime with a possibility of near normal temps in the central Plains. I'm fine with the warmth 1) because of the more active pattern and 2) because we should still be far from any records here in NE. In October, many record highs are still in the 90s. Early October is usually the very last gasp for severe weather season here before it overall gets too stable. So I am hoping we can capitalize on that. I'm all for it and it would be a whole lot better start to the new cyclical pattern to see storms coming out of the central Rockies. Even though we haven't seen our first Frost/Freezes yet, you could say Indian Summer conditions shall continue for the foreseeable future. I already see the trends, models have been under-playing the blocking in the Week 2 range and today's 12z GFS continues that trend. It's going to be a different year watching these models come in. -QBO & the SST's in NE PAC are going to be players this cold season. Yeah GFS looks kinda warm next week and then troughy after that. Would be nice if that was the trend with the new LRC evolving. Look at all that blocking! Man, that blue color looks beautiful on us. 18z GFS looks active and the Cubs clinch!! Doesn't get better than that! Fantasy land I know, but I would take that pattern as part of the new LRC! Real nice looking SW Flow and blocking! Didn't look like much a few days ago but now things are changing and looking good for an active storm track. You guys out there will prob not get as warm as us out here initially. Let's hope these trends stay consistent. Go Cubs Go! Local met on news tonight said above normal first couple weeks of October. We shall see. This is more in line with what I'm thinking for this month. Hard flip somewhere in or at the start of the last 15 days of the month. -QBO combined with -ENSO, neutral to negative AO, and neutral dropping to negative PDO means that it will most likely shift that cold spot right to the central US and GL. This late fall and winter are looking better every day. I like the active look the GFS is showing and fits the pattern evolving over in East Asia. Cutter season is about to begin and like a flip of the switch, a strong signal for a solid SW Flow coming out of the Rockies should evolve. Shifting farther east slowly in time as GEFS are keeping the Plains states more cooler than those farther east. I like this look early on in the Autumn season as a mean storm track evolves. JMA weeklies showing a strong western trough Week 2 and a big ridge in the East. Battle zone across the central CONUS. Similar signal Week 3-4 with no real signal for warmth or cold and near average temps...but I do see a -NAO showing up. 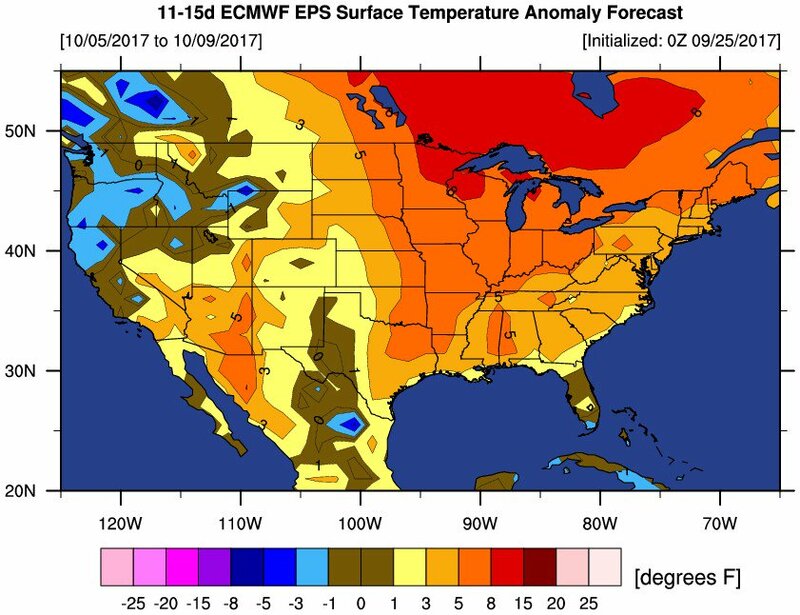 The warmth that shows up early on in the month may disappear Week 2 as a back and forth pattern hits middle of the month. That shift west-ward you mention would be very much like BAMWx's first winter temps map that Tom posted over in that thread. I noticed in their webinar they had modified that a bit but it may turn out that their original idea was the more accurate one. That kinda looks like what will be happening this October. Warm start right up until mid month or so and then, a decline in temps. Speaking of active autumns, look at how often 2007 is showing up on this analog map! ^^^ with a FOOT of liquid, who needs snow maps? Looks good to me. I'll take it and run! GEFS are trending way cooler post 10th and probably going to surprise a lot of folks. NE PAC ridge is flexing its muscle around the 8th which is something I had a hunch would transpire given the SST's. Still room for error but I think the trends are favoring more ridging across NW NAMER. You can see the trends in the N PAC and focusing more attention in the NE PAC. Over the last 4 days, it did not see the ridge...until today's 12z run...bigger implications for cooler weather in the central CONUS. Yep, that takes us (4) days beyond that CPC map I posted and aligns pretty well. (not sure what model(s) their map is based on tbh). Should be a nice autumn pattern for those to our west, that's for sure and a precursor to a pattern that would bring all that snow on the Rockies and high plains that your other map showed yesterday..
Week 2 forecasts by both GEFS/GEPS...starting to hone in on a bigger trough across the central CONUS....FWIW, I've been watching the GEPS and I didn't comment on the colder trends because the model is known to have a cold bias, but I guess other models are following suit. The ridge in the NE PAC/NW NAMER is certainly playing a role in the modeling. October will start off warm and the latter part will be turning colder. Lets see how that plays out. Hopefully, the first snowshowers will fly during this month. My local met has already lowered high temps a few degrees for late next week from last night's forecast to tonight's forecast. Using the East Asian theory, the placement of the mean trough that slowly pin wheels NW of Japan and west of the Sea of Okhostk, is sorta becoming clearer on the models to show up across the northern Rockies. I've been waiting to see where this system will track on our side of the globe and my original though was for it to hit British Columbia region. However, I did not expect to see as much blocking across NW NAMER which accounts for adjustments in the track. Based on the NW track of Japan, this makes a lot of sense to see a northwesterly track over the lower 48. Here was a map from yesterday's placement. Here is what the GEFS are showing around the 7th/8th which I believe will be around the start of the new LRC pattern. Furthermore, what excites me more is once this system in the N PAC pushes through it breaks down the ridge over the west side of the Bearing Sea which will mean the monster ridge the models have been flashing will slowly erode and push farther east allowing the storm track to shift ever so slowly farther SE. Look what happens with the next storm system tracking just north of Japan...the ridge breaks down a bit near the Bearing Sea and the storm tracks farther east...What will happen downstream over the lower 48??? Well, it's still too early to say but I expect a bigger trough across the central states post 12th/13th. Euro completely crushes our chances at a long-term warmup, advertising another cold front passage Tuesday pinning us back down to around normal with highs in the 60s and lows in the upper 40s. GFS, meanwhile, has a similar front Tuesday night, but it retreats back and pins us with above average (but not record-breaking) temperatures, along with plenty of rain, all the way until the weekend after, when a VERY strong front comes thru and gives us our first jacket weather of the season. Both are similarly wet, with the GFS slightly more so than Euro. So basically, it comes down to near-average temperatures give or take a few degrees (Euro), versus above-average temperatures followed by a very strong cold front bringing us here our first frosts (GFS). Both are very believable, and this is why I hate when stations do 10-day forecasts, because they are so unreliable. Nice info from Tom and LNK_Weather. Thanks! Man oh man, that's a nice looking NE PAC ridge....this is a great sign moving forward as it will carve out deep troughs. All the models now are catching onto the ridging in this region. FWIW, the trough/ridge placement near Hawaii in the N Pacific is almost as good as some of the legendary winters the lower 48 has seen.